The site for this temple was set by Precept Master Jajang in 642, in the 11th year of Queen Seondeok during the Silla Dynasty. It was originally named “Heungnyeondae,” but later on it was renamed “Samgongam” Hermitage by National Preceptor Beomil in 884. Afterwards, Wanggun, the first king of the Goryeo Dynasty, prayed for the unification of the three kingdoms before the Buddha here. Unification was finally achieved twenty years later. Thus, the current name “Samhwasa” refers to his sincere wish to unify the three kingdoms. 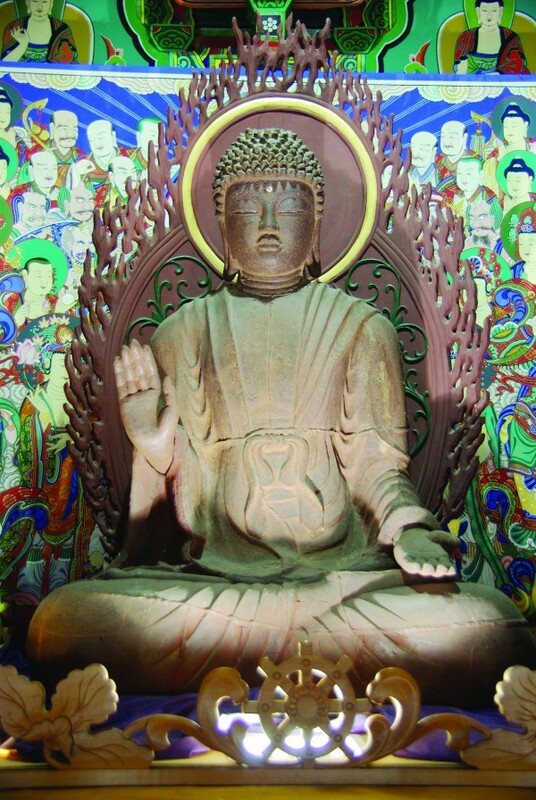 This seated Buddha was designated as Treasure No. 1292 on December 18, 1998. The iron statue was made from several connecting pieces. In 1997, there were some restorations done: both sides of the shoulders, his lower body, two hands, and the left side of his back. On the back “Nosanabul” is written, indicating his sacred name. 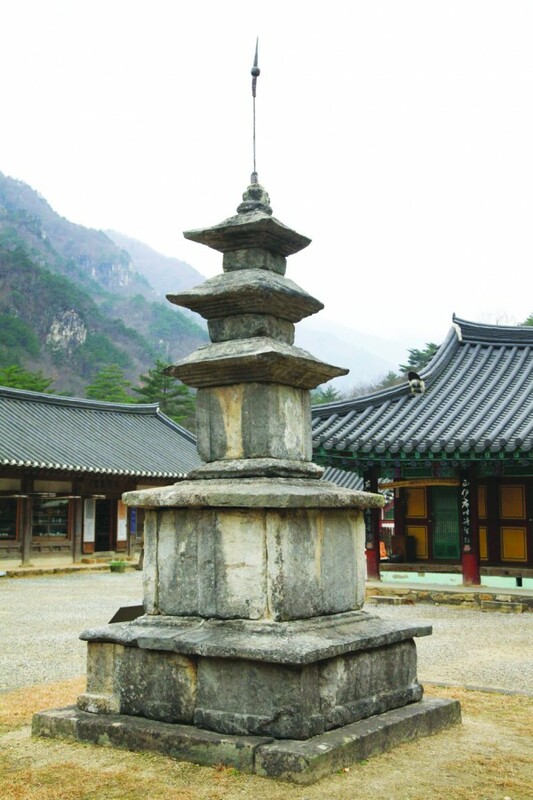 It was made around the 9th or 10th century during the Unified Shilla period. This structure is believed to be about 1,200 years old, because the top of the pagoda is covered, as if it has a lamp shade. This technique traces the work back to the 9th century, during the late Shilla Dynasty. As a part of the templestay program, you may have a chance to make small lotus lanterns and do a tapdori with your creation, circling the pagoda and wishing for your happiness and health. 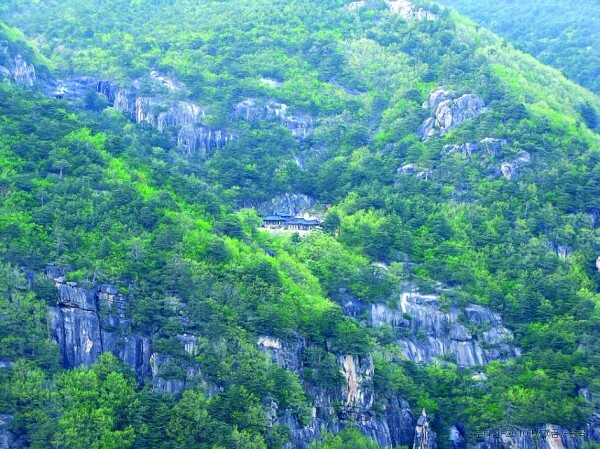 The legend traces back from a place called “Hoamso.” It said that there was a tiger running around Dutasan and Cheongaksan Mountains, and then he fell into this valley, creating a pond. 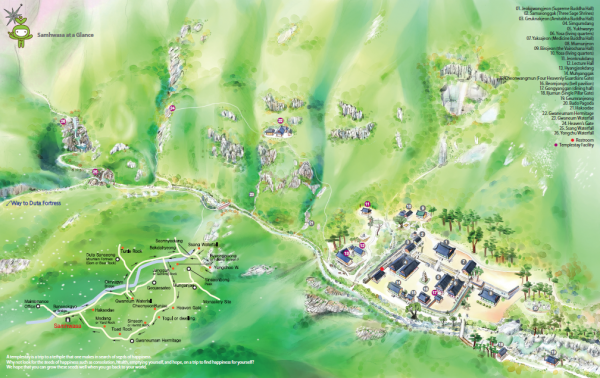 The valley is 4km long, and stretches all the way to Yongchu Waterfall. 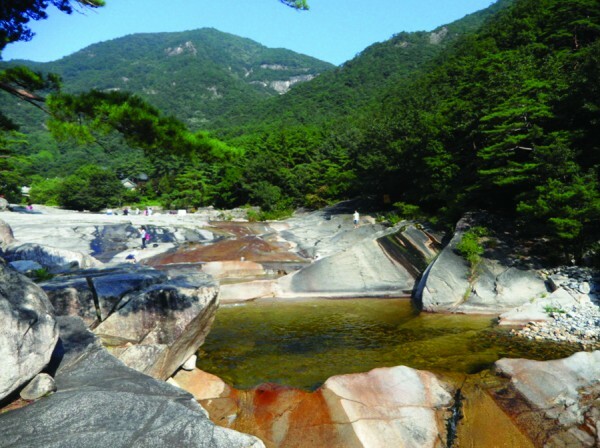 As you walk along the valley filled with oddly-formed rocks, you will be able to see such a collection of beauties: Muryeung Bankseok Rock, Haksodae, Byongpung Rock, Seonnyeotang, Ssang Waterfall, Yongchu Waterfall, Munganjae, and so on. In the past, this trail was the only way to Seoul through Imgye, Jeongseon-gun, Gangwondo Province. This site in Chuam Beach is known as the home of Korean National Anthem. 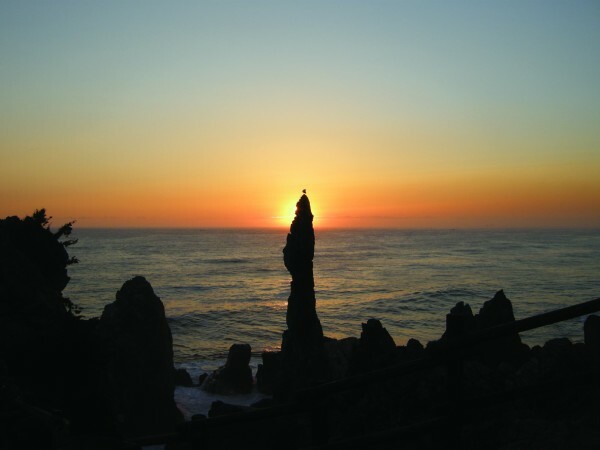 It is also famous as a great site for watching the sunrise. In the two-night and three-day program, participants take part in a meditation session at Chuam Beach while watching the sunrise. It takes about 20 minutes to get to Chotdae by bus. As you hike 1km up from Samhwasa Temple, you will find a place that shines like Buddha. Even on the coldest day of winter, you will be surprised to see how bright it can be, like when you see a beautiful flower. Originally it was named Jijoam Hermitage, but when it was reconstructed in 1966, it was renamed Gwaneumam. This quiet place calls for a short rest.